The Riddle Of The Tsangpo Gorges - Captain F. Kingdon-Ward 1926 - Edward Arnold & Co., London - First Edition	A near fine example of this important work, describing the period spanning 1924-25, during which Kingdon-Ward made what was probably his most famous and successful expedition, in the company of Lord Cawdor, to Bhutan and south-east Tibet, during which, in addition to ‘The Riddle’, related to the existence, or not, of the ‘Falls of Brahmaputra’, he collected ninety-seven varieties of rhododendron, and the first viable blue poppy seed. The Brooke-Hitching copy, housed in custom slipcase. Illustrated with a folding coloured map, and 21 photographs on 16 plates. 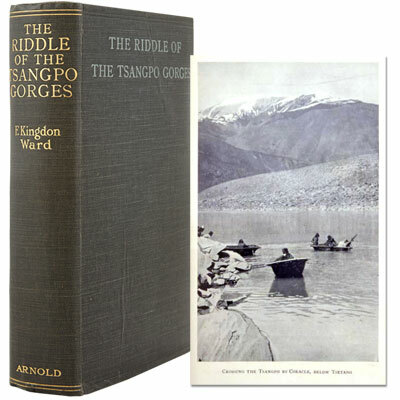 ‘It was during this long and arduous experience that he solved "the riddle of the Tsangpo Gorge," and exhibited to the scientific world his powers, not only as a first class field botanist, but as a geographical explorer also. The Tsangpo is that great river of Tibet which is the upper section of the Brahmaputra and, until Kingdon-Ward's survey, a great mystery hung over the geophysical character of the mountain section of the precipitous gorge. Close to Lhasa, the river lies at an altitude of 12,000 feet, but where it emerges from the Himalayas and escapes southward into the Assam Valley it is a mere 1,000 feet above sea level. The actual unsolved riddle of the Tsangpo Gorge was the presence, or otherwise, of the much rumoured Falls of Brahmaputra, a story, which, over the years, had become known as "the great romance of geography." Bailey and Morshead's journey of 1913 had settled the last doubts regarding the actual course and identity of the river, but the gorge itself remained unexplored as neither they, nor the Sikkimese pundit Kinthup (who travelled there almost 35 years earlier), managed to penetrate its mysterious depths. In the winter of 1924, Kingdon-Ward and Cawdor followed the river gorge down from Tibet past the great guardian peaks of Namche Barwa and Gyala Peri. Near to the base of these two mountains (the breasts of the goddess Dorje Phangmo), lie the settlements of Gyala and Pemakochung, both of which gave their names to two of Kingdon-Ward's discoveries and introductions: Berberis gyalaica and Rhododendron pemokoense. Beyond the adjacent pass named Nyima La in the Rong Chu Valley, he discovered and collected one of the best of all primulas for woodlands and bog gardens: Primula florindae. Further west, on what he described as "the wooded hills east of sacred Lhasa," he first collected the plant which probably brought him the most fame, the much acclaimed "blue poppy," Meconopsis betonicifolia. This epic expedition down the major part of the difficult gorge finally succeeded in dispelling the myth of rainbow-ringed waterfalls 150 feet high, but Kingdon-Ward found compensatory romance in the form of many more plant species new to science. The Tsangpo still guards some of its deepest secrets and, until such time as someone completes an unbroken survey along the entire length of the Tsangpo-Brahmaputra River from Assam to Tibet, the remaining mysteries will persist.’ – Tony Schilling, Frank Kingdon-Ward: Plant Hunter and Romantic (Rhodiereview, 1991). Provenance: From the library of Franklin Brooke-Hitching. Earlier signature to front free endpaper. Reference: Stafleu 16674. Yakushi, Catalogue of Himalayan Literature, (1994) K194.